WordPress SEO, I often hear a lot of different questions about SEO on WordPress. How do you apply SEO to WordPress? How can I get more traffic to my WordPress website? 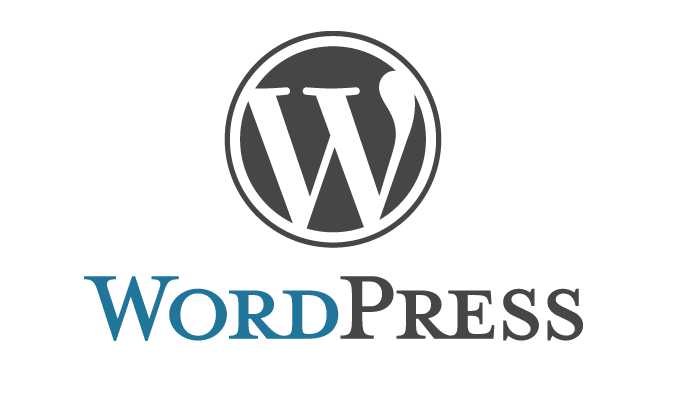 WordPress is the largest content management system in the world. In terms of ease-of-use and functionality, WordPress is a great platform for beginners and experts. I won’t go into all the details of operating a WordPress website as we’re focusing on WordPress SEO, but this platform allows you to be creative with very little skills. There’s a reason why it’s so popular, it works. Plain and simple. One of the main reasons I choose WordPress is for SEO purposes. You don’t have to be an expert to know the basics of WordPress SEO. After reading this article, you should leave here with enough to lay the foundation of your SEO efforts. Most of the SEO techniques we’ll discuss is classified under on-page SEO. This may also be called on-site SEO, this simply represents SEO techniques that can be used on your website. Before we start, I know some of you may have opinions about our techniques. Some of these WordPress SEO techniques are obvious, others are not. All I’m saying, you be the judge, take this as you will. I’ve listed all of these techniques because I’ve seen success with them all. I would never write a guide with unproven techniques. I hope this WordPress SEO Guide helps your business, helps your SEO and improves your knowledge in SEO. While many of you likely already have a WordPress website and domain name, I can’t help but mention the importance of having a keyword URL. If your WordPress website is young, you may even want to consider going with a keyword domain if you can. Now, I know other SEOs will differ and I know what Google says about domain names. But think about it, does Google want you to figure out their complicated algorithms? Easy answer, no. I’ve tested thousands of websites over the years and I know for a fact that having a keyword in your URL plays a role where you rank for that keyword. Without a doubt there’s some importance here. When I evaluate a website that has no social signals, low page rank, low page authority, low domain authority and a handful of referring domains with similar web metrics and I see them ranking for their keyword domain, I know why the domain is ranking. True, there’s hundreds of SEO ranking factors to check, but the case studies are proof that having a keyword in your domain is an important factor for them ranking the specific keyword. There’s a reason why the Yoast SEO plugin has been downloaded nearly 15 million times and most of their plugins with millions more. This is by far the best SEO plugin to choose from your WordPress website. If you want an instant upgrade to your WordPress SEO, get the Yoast SEO plugin downloaded and activated. Yoast has a number of different SEO fields that will require your attention. The Yoast plugin is going to add all the essential elements you need to fill in your SEO fields. Yoast will give you all your metadata fields for pages, post, media and tags. You’ll be able to find the Yoast SEO field at the bottom of your pages and post. You need to make sure that each page and post is unique and accurately describes the article. After the Yoast SEO plugin is installed, you’ll be able to add all of the important SEO elements to your website. First, we’re going to look at your SEO options with post and pages. There’s been a long debate about the SEO weight of a post and page in WordPress. After years of using WordPress and countless studies, I suggest that you use your post rather then pages. The only reason I came to this decision is the fact that you can add tags to post. With pages, you don’t have that option. Tags can rank just like a keyword and we’ll discuss the important of tags and SEO later. As you can see above, the Yoast SEO plugin gives you a number of different options and analytics for your WordPress pages and post. 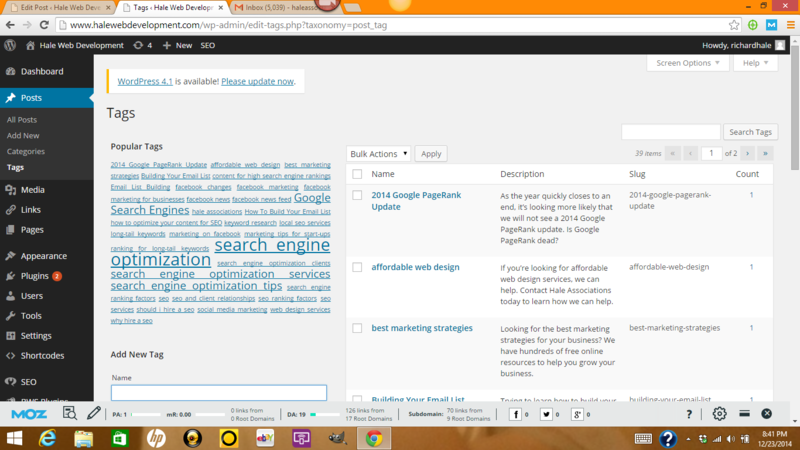 In the General Tab, you’ll see a snippet preview of what your article will look like in the search engines. This is not always accurate, but gives you a good general idea what it’ll look like. The Focus Keyword is for your main keyword. Yoast also checks to see if your focus keyword is included in the article heading, page title, page URL, content and meta description. The SEO Title is for your page and post titles. This is important because this is the title that is displayed in search engines. Lastly, you have your Meta Description. The meta description also appears in search engines. It should include your focus keyword and accurately describe the article. Remember though, your meta description should also entice a user to click on your article as well. 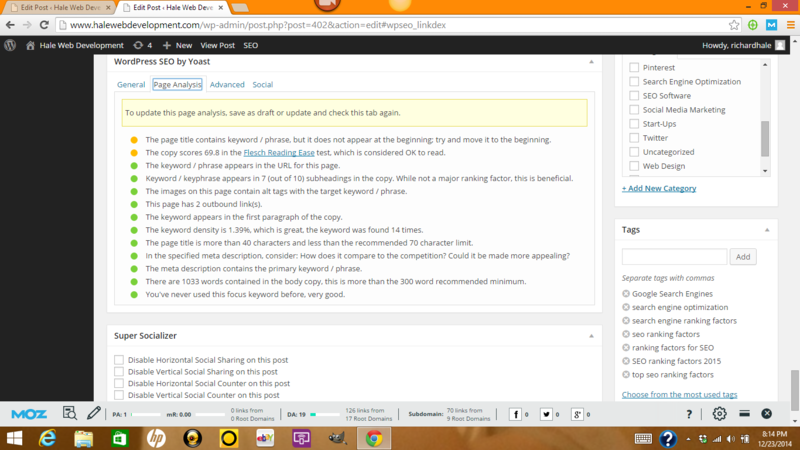 The Yoast SEO Page Analysis is a very useful feature of the Yoast SEO plugin. This allows you to optimize your WordPress pages and post. It counts the total words in your article, the focus keyword, if images have been added, if the keyword is in the title and many more important elements that are associated with SEO. There’s three scoring colors that Yoast uses to score your SEO, green, yellow and orange. Green is your highest scoring margins, followed by yellow and then orange. 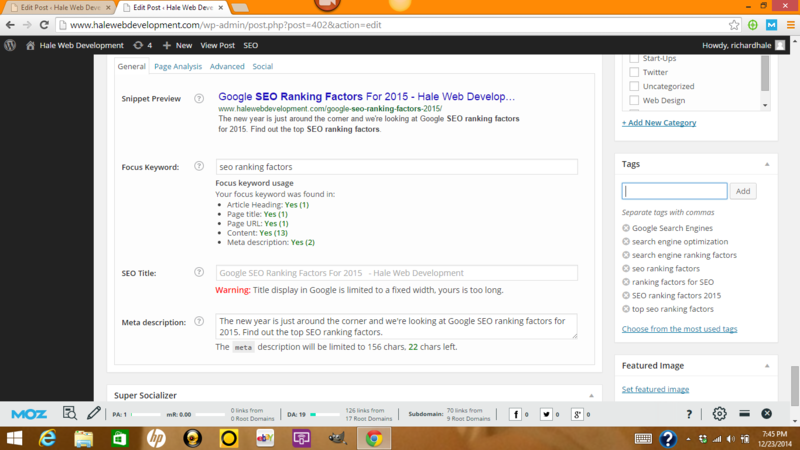 When the light is green, that SEO element is in line with Yoast’s SEO ranking factors for the given element. When it comes to WordPress SEO, there’s not a better free plugin out there over Yoast. Make sure you take the time to explore the Yoast plugin and get to know all the features. It will be a huge benefit to the visibility of your website. Your tags are an important element for your SEO efforts. With WordPress, you can use your tags in a variety of different ways. You can use them for navigation and classification purposes. But most importantly, you can use your tags to optimize your WordPress SEO. Your tags can rank just as a keyword. This is one of the techniques that others may frown upon, I’ve seen tags rank steady for years. So yes, optimize your tags. 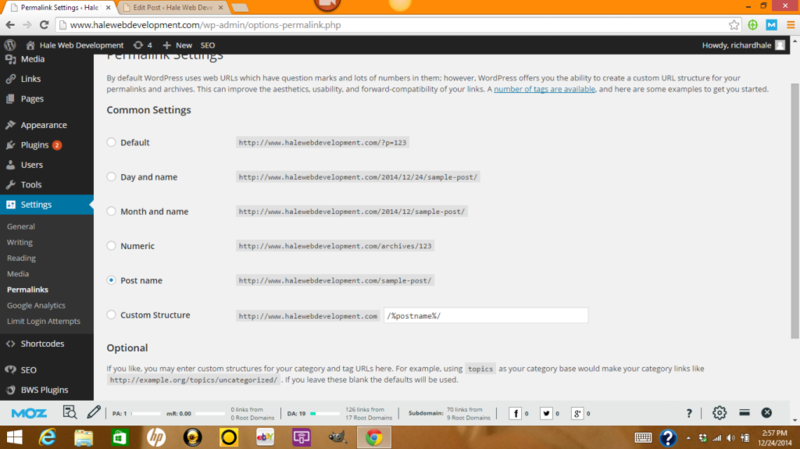 As you can see in the picture above, this is your Tag Page in WordPress. With all of your tags, you can add a SEO title and meta description. 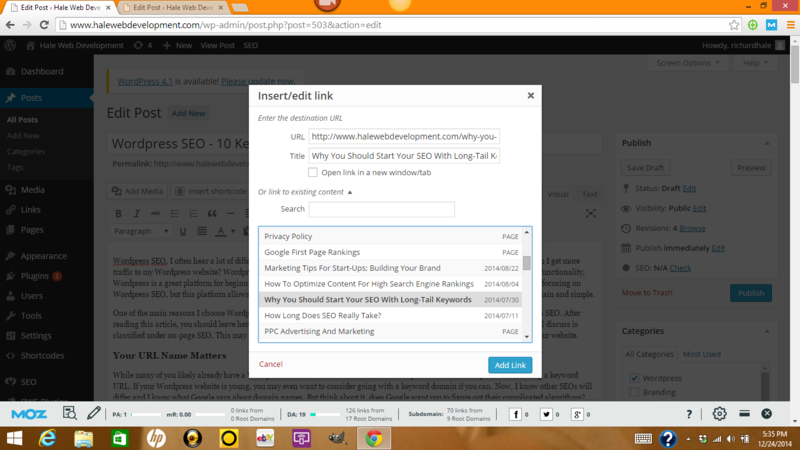 You can also add keywords, a new slug, canonical link and you can choose to index the tag or include it in your sitemap. You definitely want to include your tags in your sitemap and you also want it indexed. You can create all the tags you want, but I suggest not to over-use them. Each tag that you create will have an unique URL. All of the WordPress post that you a specific tag on will be listed under this specific URL. If you have some type of SEO software that tracks the keyword you rank for and the specific URL link that the keyword is ranking for, you’ll be able to track what tags are ranking in search engines. Moz software and SEO Profiler are two that provide this useful resource. Remember, search engines are all about the user and user experience. Tags are a great way to help your users find content throughout your website. I’ve looked at several websites over the years and I’ve seen traffic be more relative from tags. How many tags should you add? This can vary. I suggest that you test different methods, the reason I say that is because I’ve seen success on both sides. Use a handful of tags at most. Make sure your tags are accurate also. Every post may not need tags, other topics may be more relative. User experience is becoming more of a lead ranking factor, so always try to keep that in mind. Post and page titles are another important element for SEO rankings for your WordPress website. When you go to create a new post or page, the very first option you have is to enter a title for your article. Best SEO practice is to use your Focus Keyword in the main article title. For example, if you’re trying to rank for “Social Media Marketing,” then you want to make sure that you use social media marketing in your title. This will be your focus keyword. And again, refer back to your Yoast SEO plugin. You want your main keyword to be in your title, sub-titles, content, images and your metadata. For those of you that don’t understand metadata, we’ll discuss this topic later. We now know that we want to use our main keyword in the title and at the beginning of the title if possible. This SEO technique may not work for all your keywords, you may have to place it elsewhere in the title. This is ok, but ALWAYS include your main keyword in the title. Can you list two keywords in your article title? I get this question a lot, the answer is yes. Take the title of this article for example, it has (2) keywords in the title. The first, “WordPress SEO.” The second, “Increase Your Visibility In WordPress.” This is a common SEO technique that is used when optimizing your content for SEO. The last thing you need to know about page and post titles is Writing Great Titles. Not only do you want your titles to be optimized for SEO, you also want people to click on your article in the search engines, right? You need to be creative with your article titles. You want your titles to be interesting so potential visitors will click on your article. If you have a high search queries but a low (CTR) click-through-rate, it can be a sign that your titles are not enticing people to click on your content. You can check these web metrics with Google Webmaster Tools. Permalinks are a fancy name for your website’s URLs. Every permalink on your website should be unique. There’s a variety of different ways that you can optimize your permalinks for SEO purposes in WordPress. You can see the different permalink options you have in the screenshot above. For example, our website is https://halewebdevelopment.com By default, you get a permalink structure like >>?p=101. As you can imagine, this is not a good permalink structure for your URLs. Remember, you want your main keyword in the link. If you go to the Custom Structure option, then you’ll have the https://halewebdevelopment.com/%postname%/ This gives you the ability to change the permalink to the title of your post, which should be the way it’s setup. I prefer to keep my permalinks short and simple. In terms of suggested best SEO technique, some believe shorter pemalinks perform better, others believe longer permalinks are the way to go. I suggest that you make sure your keywords are in your permalink, add the category if you wish. Categories have minimal SEO weight if any. Key note, once your article is published, your permalink is set. If you change your permalink after the post is published, you’ll get a broken link for doing so. You would have to delete the database or redirect the old link to the new permalink to fix this issue. A broken link is also known as a 404, or 404 error. This simply means that the page can’t be found. As I said a few paragraphs ago, there’s a lot to learn about when it comes to links. Here’s (2) more terms that you need to get familiar with. Do Follow Links and No Follow Links. The no follow attribute was designed to reduce link spam. When a link has the attrubte “no follow,” that link doesn’t pass value, also called “link juice.” Do follow links pass value through the link. If an authority website links to you with the do follow attribute, you get the value passed on from that website to your own. Very crucial element in ranking keywords and WordPress SEO, SEO in general. There’s a right way and a wrong way, some with disagree. I already know that, but this is my suggestion. You may have several pages on your website that have no value in the search engines. Contact pages, payment policies, disclaimers, do you really want to pass your own link value to these pages? Likely not. The more you spread your own link value through your website, the less all your pages get. That is something important to consider. I would suggest using the no follow attribute to the pages that don’t need the link value. Here’s an example of the two link types. It’s important to note that you don’t get carried away using this technique. For pages that have no purpose in added value as the examples above, you can use this technique. There’s been a lot of questions about this in recent months, especially in 2014. To what extent you should use these? Sparingly. I also list this so you know how to build your links if you want to build a follow external link or build a no follow link. One key element to your articles is Internal Links and External Links. Both internal and external links play an important role to the page value of your article. Link Building is a whole new topic and takes time to develop the right understanding of how links work and affect your SEO rankings. Without the proper SEO software, it will be difficult to analyze the value of certain links. So if you’re serious about ranking your keywords and growing your business, you need to invest in some SEO software that can track link metrics. In terms of tracking links, you may want to consider Moz. Moz is a popular SEO platform and has several SEO tools that you can use. Some are free but limited, but it’s worth the investment. You may also want to consider Raven SEO Tools or SEO Profiler. WebMeUp is a great tool for link building and link metrics also. If you don’t do that, you may wish to hire a SEO expert. Back to the importance of your links. Links are an important element in your content. Just like the links you find in this article, all of them are relative to the content. You don’t want to write an article on WordPress SEO and link it to a story about animals. Keep all of your links relative. As you begin to build your content, you’ll have more opportunities to link back to your older articles, this is very useful. This improves the value of the page, gives the reader the opportunity to find what they need and helps you rank for more search queries. This is Internal Link Building, building links back to your older pages and post. External Link Building is when you build links in your articles to other websites. This is another way that you can build value to your page. When you build value to an article for SEO, this increases the overall value of your website. It can improve several keywords that may be listed in the article. You have to be creful who you build links to, don’t just link out to anyone. A lot of people will type the “to-be-text” in Google search and link to the article that ranks first for the key phrase. It can be an effective technique to use. If you build your external links to authority websites, you do get a benefit to your own page. Plus, you increase the opportunity for someone to link back to your page. Another great thing about using WordPress is the fact that you can optimize your images. With the Yoast SEO plugin and built-in options from WordPress, you can add everything you need to rank your images. The most important part of image SEO is IMG ALT Text. Search engine bots can only read text at this time, they can’t see your pictures. Due to this, the only way they can know what your picture is about is through the IMG ALT text tag. Just like you focus on listing your main keyword in the title, you should do the same with your WordPress images by including your keyword in the IMG ALT text. By doing so, the search bot will know what your images are and in return, you get all the SEO benefits. Images can also have metadata applied, which is another benefit to your SEO efforts. Just like you can add SEO titles, focus keywords and SEO descriptions to your post and pages, you can do the same for your images. A lot of people search for different things through Google Images, especially products. Now, if you’re using the Yoast SEO plugin, it will be tough to turn your images green. At best, a yellow should be good, so don’t sweat if you can’t get a green light on your images. WordPress is bad for HUGE amounts of comment spam and pingback spam. At this day and age, there’s likely millions of people use automated link building software that attacks websites with comment spam and pingbacks. Have you ever read a comment on your articles that is out of this world? It doesn’t relate to anything you wrote or it may contain 200 links. All of this is spam and can harm the value of your pages. You need a comment system that allows you to monitor all comments before they are put on your database. Even WordPress comment plugins are often compromised by this technology. I had a few CAPTCHA plugins that I thought would protect a website. Came into the WordPress dashboard and saw 77,742 new comments. I give them credit, this was a new world-record for me, surpassing the 3,320 I received a few years ago. Luckily, one plugin can erase all of these comments off my database. You may want to consider turning your comments off at first until you get to the point that you’re actually bringing in targeted traffic rather then spam comments. DISQUS and LiveFrye are two great WordPress plugins that you can use for comments. Both have growing communities and allow a variety of different options for commenting. This is what I usually use, although I have my comments turned off as of this article. I do planning going to DISQUS commenting very soon, so you may see that I have this up now. Pingbacks are the same way, most of them are spam. Yes, it’s true that some pingbacks can help. By default, if you write an article on a related topic you wrote on previously, you may notice comments from your own website in the comment dashboard. You can turn this off in your settings if you wish too. Pingbacks can help you build links, that is one of the perks. However, I see more negative results from them so I suggest to do without them. Remember when we discussed the Yoast SEO plugin earlier, once again, we’re on the topic of metadata. This goes to show how important the Yoast plugin is to your SEO efforts. Metadata is defined as a set of data that describes and gives information about other data. Metadata can be added to a variety of different things and nearly all of it relates to SEO. We talked earlier about the ability to add SEO titles, keywords and descriptions to your pages and post. This is also called your metadata. We discussed the same for your images. You can add the same elements to all your images, also known as metadata. More less, metadata is the terminology given to your SEO titles, descriptions and keywords. There’s a lot of different things you can do with your content to optimize it for search engine optimization. We’ve already discussed your main keyword in the title, permalink, sub-titles, content and metadata. There’s often a discussion about the length of your content also. Some people suggest at least 300 words, others suggest as much as 1,000 words. I’ve seen all types of content over the years, I’ve seen short articles rank on top. My suggestion, don’t concentrate on the length of the article, concentrate on the quality of the content. If you focus on making your content great, the length won’t matter. We do have a great resource for those of you that want to learn more about SEO and content. Optimizing Your Content For SEO. One of the most important things you’re going to do is your Keyword Research. There’s a number of free tools that you can use to research keywords. Google Keyword Planner is probably one of the most used SEO tools for keyword research. You do have other options available also. I prefer to use SEO Profiler and the picture is just an example. This article is about WordPress SEO. As we can see, WordPress SEO is searched for 3,600 times in the United States each month. While the traffic stats are not incredible, there’s traffic for the keyword. Another thing to consider is the competition for your keywords. In this case, WordPress SEO has a competition rate of only 13 percent, which is low. This keyword will be easier to rank for then other keywords that would have a higher competition rate. 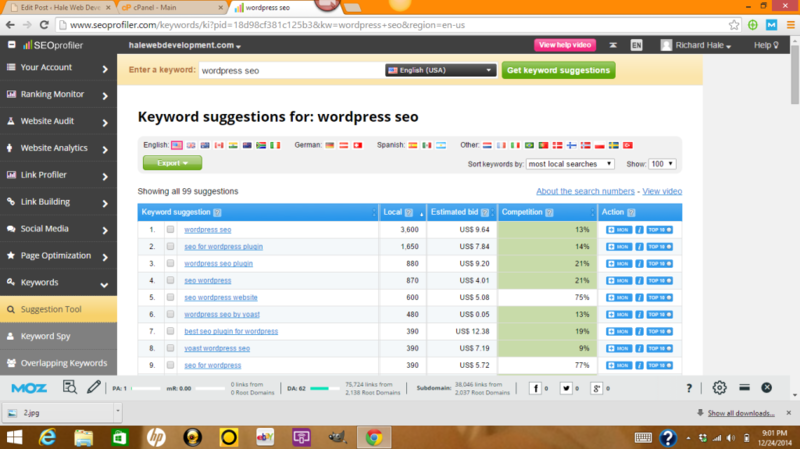 This tool also shows you other keyword terms related to WordPress SEO that could be used if needed. The estimated bid metric that you see is for Google Adwords, that is Google’s paid advertising network. You need to think about your keywords. Most of us are either offering a service or a product. You want to target the right traffic to your website. If your traffic is high but no one is buying your services or products, then you’re likely targeting the wrong traffic. This is a common mistake with websites that are unsuccessful. Take your time making your keyword list and focus on the type of keywords that will bring the right traffic in. Your Homepage is the most important page of your website. It is also the most valued page o your website. If you have SEO software or web metric tools, you’ll see that this is true. Everything on your homepage is important for that very reason. The further you get away from your homepage, the least value you will find. In most cases, this is true. Remember, every page, post and link has a value. No two links have the same value, most of your pages will have different values also. Your most important keywords should be used on your homepage and shouldn’t be no more then one click away from your homepage. Secondary keywords should be no more then two pages away from your homepage. You want your main pages to get most of the value, so keep them close to the homepage. Most of us use our main keywords in the main navigation menu. Your WordPress theme will play a role in your SEO efforts. You should want a theme that has stationary content on the homepage, at the least for your main keywords. This would be a benefit to keyword rankings since your homepage will always be the highest valued page on your site. If your content on your homepage is always changing, this can affect how you rank in search engines. For a start-up website, this is more of a concern than an established website with more value. Many people start out on WordPress with a free theme and there’s nothing wrong with that. Some free themes are great, have many different options and functions. Many are becoming responsive and you can’t beat a free theme, right? However, your WordPress Theme can be great for SEO, good for SEO or bad for SEO. And I know this is a lot to take in. but I wanted to do a great WordPress Guide to SEO that gave you everything. One SEO ranking factor that many believe in is the HTML vs Text ratio. You should aim to have more text on your WordPress website then actual HTML. Some WordPress theme have terrible HTML/Text, so this is something that you have to keep in mind. Another thing you want to consider when choosing a theme for your WordPress website is if it can be displayed on all devices. More people are switching to mobile, we’ve been seeing this for years. You want a responsive WordPress theme. A responsive theme will allow your content to be noticed on desktop, mobile and tablets. Very important. Responsive designs are very important. Make sure you choose a WordPress theme that is responsive on all devices. The world has been switching to mobile for years and we have 2 Google bots, one for desktop and one for mobile. Many themes are focused on one or the other. However, if you can provide both, the return will be much greater. Desktop vs. Mobile SEO is a whole new article, but something that you need to be aware of when optimizing your WordPress website for SEO. 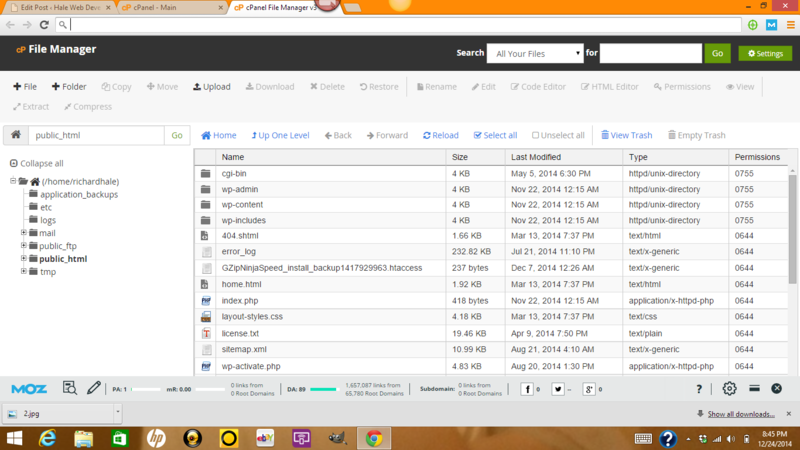 Some WordPress themes are built like a champ when it comes to loading speeds, others are very slow. While plugins are great for those of you that don’t know programming and code, they can also slow your website down. Some plugins are loaded with files. The more files you have, the longer it takes to read through them files. You can test the speed of your website with Google’s PageSpeed Insights. Not only will it give you the speed score, it will also give you important recommendations that you should consider. This is another question that I hear a lot with WordPress owners. Which URL is better for SEO? There’s two different ways to access your website, with www and your domain name, or just your domain name. By default, WordPress automatically does this for you, but it’s viewed as a 302 redirect rather then a 301 redirect. What is the different between 302 and 301? Both are redirects, except 301 is a permanent redirect and 302 is a temporary redirect. Changing this can be tough, especially if you don’t know web programming or SEO coding. You do want to change this and the only way to do so is by changing your .htaccess file. You will find this on your server. Many people may choose GoDaddy, Bluehost or Hostgator. You’ll need to access your server, likely a C Panel to change this temporary redirect. Below, you’ll see the code that you need to add. Instead of using our domain name, you would switch this out with your own. Again, please don’t forget to remove our website and add your own domain name. You need to find a good social media plugin that you can use to share your articles and content. Social media is becoming a much bigger SEO ranking factor and now controls 7 out of the top 10 SEO ranking factors. In my opinion, Google views social likes, follows and sharing as a sign of trust, like Google did years ago with links. Since links can be false positives per say, appears that Google feels that social signals can be trusted more than links. Don’t get me wrong, links are still important, but Google is counting links less. 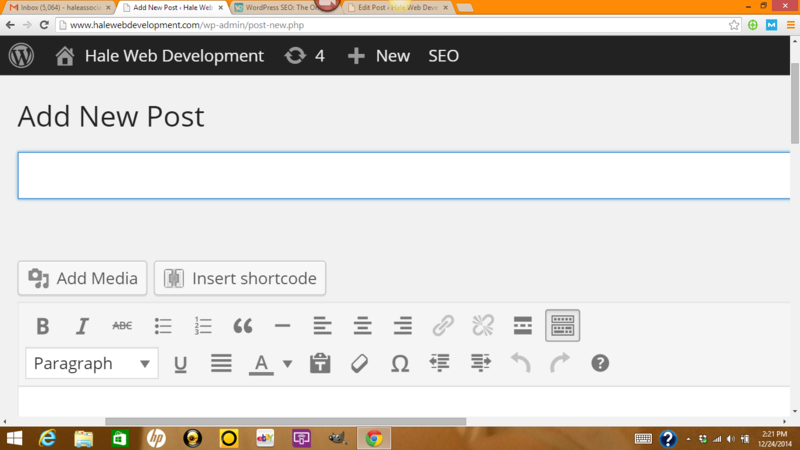 Now, you can also use shortcodes or social button codes to add social sharing to your content. Either way is fine. Personally, I prefer Shareaholic. This plugin gives you everything you need and then some. There’s two versions of the plugin, I don’t know why because they appear to be the same. But together, you see over 4 million downloads. 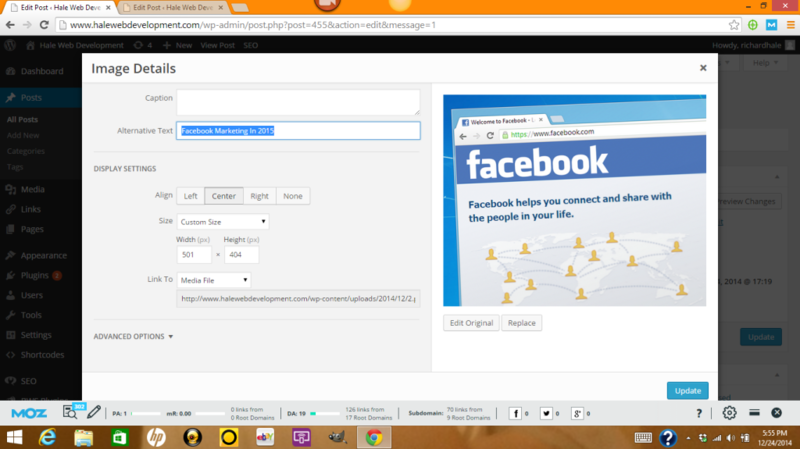 This social media plugin for WordPress will allow users to share your content, which is exactly what you want. The Shareaholic plugin also comes with some features that will share your content at the bottom of the article, sharing related content. This is always helpful as it shows more of your content to users. Shareaholic can also count the number of shares, which we all like to see. The plugin has several other options, even allowing you to earn some extra money. 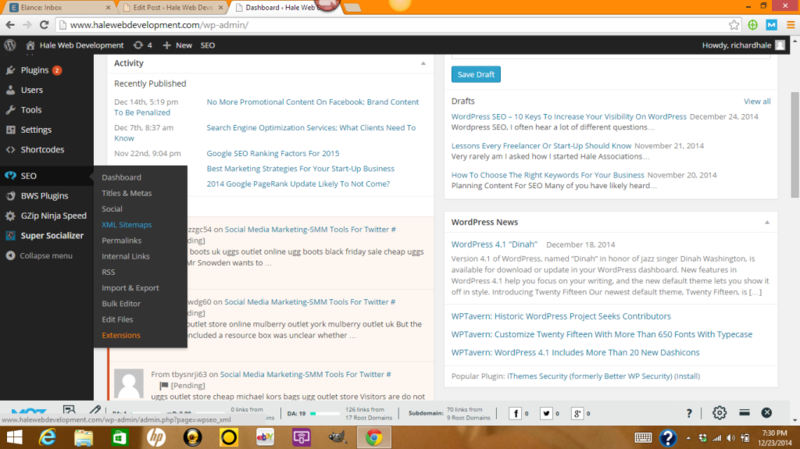 When it comes to WordPress social media plugins, I highly suggest Shareaholic. A sitemap is another important element for SEO. Google also tells us that it’s important, so we know it is a benefit. Your Sitemap will help Google find all the different pages and post on your website. Once again, we point back to the Yoast plugin, which has a XML Sitemap Generator. Your sitemap is often changing, depending on how much new content you’re creating. Sitemap automation is a great thing and with Yoast, you’ll have that ability. There’s also several WordPress sitemap SEO plugins that you can choose outside of Yoast. Another thing I’ll suggest is building a sitemap page. Some sitemap plugins will give you a shortcode and all you have to do is add this shortcode to a page and you’re done. If you have a big website with a lot of content, this is probably your best route rather than building a sitemap page manually. You’re going to need two important tools on your journey and both of them are free. 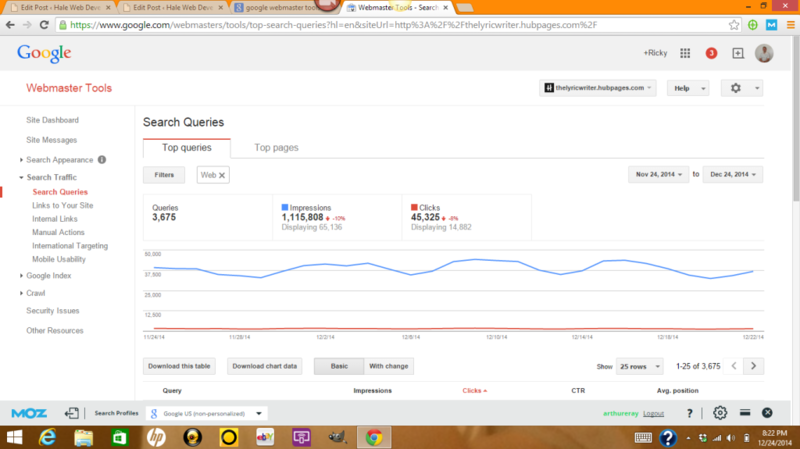 Google Analytic and Google Webmaster Tools. Tracking your results is going to very important and both of these free SEO tools are extremely beneficial. Google Analytic can help you track a variety of important web metrics and helps you focus also on user experience. You can track the average time on your website, time on pages. You can also track your bounce rate and exit rate. Since user experience is becoming more and more of a large SEO ranking factor, this is going to be important for your website. Google Webmaster Tools is also important, it also tracks important web metrics for you to evaluate. You’ll be able to submit your sitemap to Google from there, track search queries, search engine impressions, click-through-rates and more. The combination of these two free tools along with SEO software can really help you analyze your website from different perspectives. You hear about user experience a lot. Why? It’s crucial to the success of your website and business. There’s a lot of user experience ranking factors that count and we’re seeing user experience become more important. A lot of people focus too much on SEO and they forget about the user, big mistake. You have to keep your user top priority. Always keep them in mind through the process of your WordPress SEO, landing pages, opt-ins, everything you do. With Google Analytic, you can track important user data like time spent on a page, bounce rate, exit rate, average time on site, traffic behavior and much more. Your entire business should be built around the user and not SEO, so always keep that in mind. You’ll be able to track all this data with Google’s free tool and you can improve your pages by focusing on the weakest pages on-site. Track them, make the page better and use A/B testing to find the best conversions. There’s a lot to learn about WordPress SEO. Each one of these examples adds another meaning. Each of these categories could come with a 4,000 word report. There’s thought to be over 200 different SEO ranking factors in total, possibly even more. SEO is always changing also, we usually see a few Google updates every year. If you’re an upcoming SEO, you can never learn enough. Keep learning and continue to improve your performance. If you’re a business owner or webmaster, continue your SEO education. Search engine optimization is a solution but it’s not the complete evaluation. This is important to know. SEO can only get you so far. It’s the total effort that makes a website successful.